LoRaWAN open standard is a type of Low Power Wide Area Network (LPWAN) protocol designed to wirelessly connect battery-operated devices to the Internet. With the long range characteristic, LoRaWAN fulfills key IoT requirement, such as bi-directional communication, end-to-end security, mobility, and localization services, regardless of regional or global networks. According to Hickey, LoRaWAN has the great advantage of a 5- to 10-kilometer transmission range, which overcomes outdoor environment for wider network areas. The technology also focuses on the low data rate applications, meaning it’s suitable for devices that only transmit smaller amount of data in a relatively infrequent intensity. Examples are sensing solutions and metering facilities. Low data rate also enables a longer battery life. This directly lowers the maintenance cost, making the installation and management economical. In addition, the transmission in buildings or wider area requires no extra access points and is not limited to Internet connection, further emphasize the low-cost benefit for IoT industries. To clarify, LoRa is the physical layer to create the long-range communication, and LoRaWAN is the open networking layer that delivers bi-directional communication, mobility, as well as localization services. “Following the same open standard, all the LoRaWAN-compliant devices and networking software are able to interoperate in the ecosystem,” added Hickey. While the specification defines the technical implementation, it does not strictly define any type of deployment, therefore offers the industry players the freedom to innovate the LoRaWAN usage based on individual demands. Day after day, the technology is differentiated into either shared or private systems designed for enterprise use or end-users. 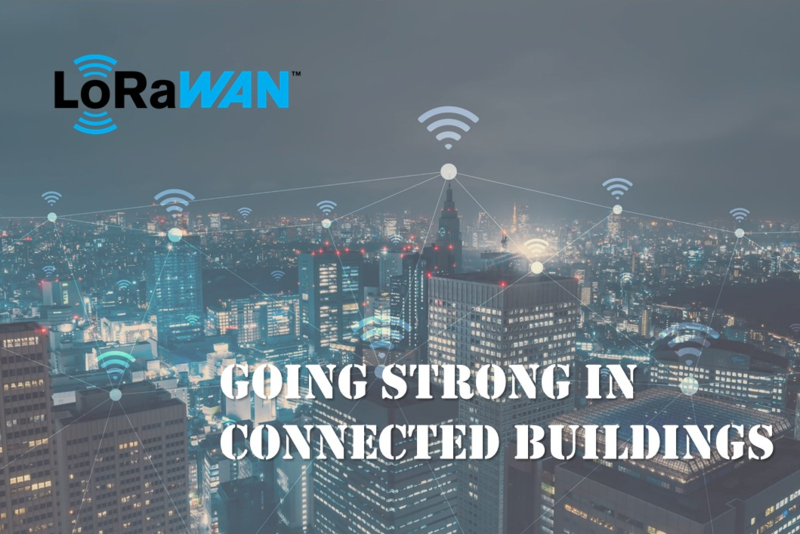 A growing number of industry players are looking into the opportunity to apply LoRaWAN into smart buildings and homes. For commercial buildings, there’s a large desire for the efficient operation and management. As for the residential homes, the simple installation, maintenance and monitoring features are appealing. Sensors and gateways are the most common devices using LoRaWAN technology. According to Hickey, there are three types of LoRaWAN devices, and the Class A is the most common. With preset time frame or schedule, Class A devices only wake up on the certain times and send sensing data to the gateway, therefore consuming least power. Those long-lifetime battery powered sensors are within this type. On the other hand, the Class C devices are always listening to commands and are plugged to power. They can work as emergency alerts or automation controls with the lowest latency on downlink. Netvox and Radio Bridge are two IoT experts developing LoRaWAN devices and focusing in applications of smart home and building. Based on the abundant experience in IoT and Zigbee development, Netvox is an industry pioneer who already markets over 70 types of LoRaWAN products globally including hardware, cloud and software. “At the time we joined the LoRa market, a lot of areas have just passed infrastructural POC (Proof of Concept) and needed a lot of applicable solutions. Netvox devices supports multiple radio frequencies of different areas like Europe, US, Australia, Japan, India, and China, and had chances to deploy the IoT devices rapidly in cooperation with operators,” shared Kent Shen, Vice President of Netvox Technology. Netvox has complete product lines of gateways, environmental sensors, security sensors, wireless controls, and metering devices, covering both indoor and outdoor part of smart homes, offices, campus, and smart agriculture. For property managers or rental house owners, the Netvox patented multi-gateway system is a handy solution. The system combines all the management and data monitoring into one platform, making it easier to collect and supervise sensor readings from various locations under different networks. Denver-based Radio Bridge is a LPWAN technologies leader who supplies finished sensor to cloud solutions that run on LoRaWAN, Sigfox, and the proprietary protocol SUBGIG. “Long range, extended battery life and low cost are the three pillars of ideal sensor design. In the case of both LoRaWAN and Sigfox, the cost is less than a dollar per month, per device, to connect directly to the network operator,” cited Steve Kilts, Co-founder and CEO of Radio Bridge. Radio Bridge works with network operators, gateway providers, and IT technology companies to deliver complete customized solutions. Kilts sees that the US market is having great interests in LoRaWAN deployment, and the building monitoring application is a potential that cannot be overlooked. Semtech, the provider who first rolled out LoRa technology and a founding member of LoRa Alliance, has seen the growth of LoRaWAN deployment worldwide. “Good adoptions available with operators in Europe, Australia and US as well as the other aspect of LoRaWAN using unlicensed spectrum to create private network are enabling users to quickly roll out their service,” explained David Armour, Strategic Marketing Manager, Wireless Products of Semtech. 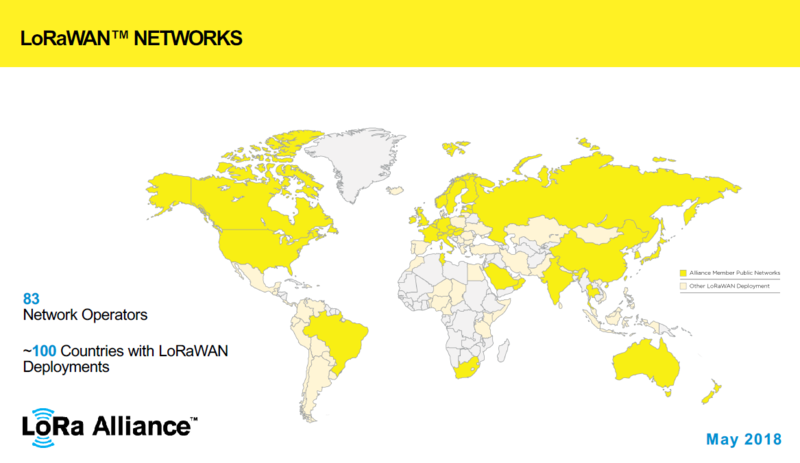 LoRaWAN global network presence. Yellow areas are the alliance member public networks, beige areas are other LoRaWAN deployment. Where the open standard is provoking diverse possibilities, Semtech and IC designer AcSiP Technology are both positive to the various vertical market solutions. Earlier this year, the latest LoRaWAN location service is introduced to enhance management and tracking of factory asset, personnel in the building, product shipment, or even pets. “In the open market of LoRa transmission, AcSiP has been collaborating with tens of vertical solutions with our aim to reduce clients’ hardware development cycle and maximize functionality,” said Allen Xie, Marketing & Sales Director of AcSiP Technology. Xie believes that the multiplied applications are going on the next climax in three years, “IoT solution is what people are looking to bring the next convenient smart living,” he added. According to the industry leaders, security or environmental sensors for water leakage, movement, door and contact activities, as well as humidity and temperature are the most popular ones deployed in smart homes and buildings. When users place a water leakage sensor beneath the pipe, it can either be activated when the pipe leaks, or wakes up every 30 minutes to detect the pipeline pressure and sends the information back to the gateway. Property owners will be notified before the pipe goes in danger of burst. Suitable prevention can be made accordingly to reduce unwanted damage or loss. Door/window sensor is another example for hospitality industry. One LoRaWAN gateway can connect bunches of door/window sensors throughout the huge hotel buildings. When the sensor reports abnormal door or window activities in unoccupied rooms, the system can trigger instant alert to the security guards. No intrusion can hide from such solution, therefore guaranteeing a securer stay of the hotel guests. Apart from private home and buildings that require secure data protection in private networks, some remote workplaces are especially mentioned to often deploy private LoRaWAN networks. Remote mining spots or oil fields might need transmission range to more than 10 kilometers. In this way, businesses can develop private LoRaWAN network customized for professional sensing data. Private networks are not reliant to telecommunication companies for infrastructure deployment, which make the usage flexible.